The PGA Class A golf professional is ready for today’s opening of The Waterside Course, the new back nine at Baywood Greens in Long Neck. “We’ve been looking forward to this for a while now,” Barrows said. The celebration starts with an on-site broadcast by WGMD (92.7 FM). It continues with a special promotion sponsored by the I.G. Burton auto dealership. The first hole-in-one on the 6th hole each day, from today through May 29, wins a two-year car lease. 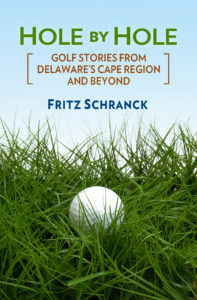 “Baywood should soon be recognized as the premier golf course in Southern Delaware,” Barrows said proudly. Based on a recent site visit, Barrows might be right. Tunnell Companies, L.P., owners of the public course, obviously spared little expense in the design and construction of this stunning layout, including 23 acres of ponds. Here’s a hole-by-hole description, using the black tees recommended for handicaps between 10 and 19. At these distances, the overall course rating is 70.8 and the slope rating is 126. No. 10 (383 yards)—This green on this dogleg right par 4 is almost an island, nearly surrounded by sand instead of water. The bunkering permits chipping out for those hitting short of the green. No. 11 (169 yards)—This picturesque par 3 puts a premium on distance accuracy, with a wide but narrow green. The pond in front sweeps behind the hole on the right side, however, and can’t be seen from the tees. No. 13 (501 yards)—The tee shot on this par 5 comes out of a chute of trees that will “keep you honest on the right side,” according to Barrows. “The best approach is to aim at the left side fairway bunker about 250 yards out, and cut it.” Water on the left side of the green should only be in play when the hole is also on the left side. No. 14 (397-409 yards)—This par 4 starts a dramatic set of three holes, and features a split fairway. A drive to the island fairway on the left forces an additional carry over water to the green. The safer fairway drive to the longer right side, however, requires an approach over a large greenside bunker. No. 15 (170 yards)—This medium length par 3 rises dramatically more than 16 feet above the pond facing the tee box. Barrows said, “The change in elevation should force at least one full club more for most golfers than what they would normally use.” Cape Region golfers not used to heights will likely make chip shot approaches to the terraced green. No. 16 (473 yards)—This is the visually impressive par 5 adjacent to Route 24. Drives to the left of the fairway will find either a waste bunker or the pond running the length of the hole. The landing area is wider than it appears from the tee box, however. Going for the green in two is risky because the pond also cuts in front of the green. The water hazard is not visible from 100 to 125 yards out, but it’s there. No. 17 (386 yards)—The drive on this fairly straightforward par 4 should favor the right center of the fairway, which will open up the green approach. Those hitting to the left side must carry their second shot over a stand of trees about 80 yards from the green. No. 18 (379 yards)—This beautiful finishing hole uses island tee boxes fringed with flowers. The pond behind the green will punish those going too far on their approach. Barrows and the rest of the staff at Baywood Greens should see a busy new course this weekend. If the course plays as well as it looks, they should stay busy all season. 18-hole rates through Labor Day: Friday-Sunday and holidays, $68; Monday-Thursday, $56. Twilight and 9-hole rates are also available. The No. 3-ranked Cape Henlopen High School golf team finished their regular season on Thursday, May 18 with a victory over Indian River at Cripple Creek Country Club, 172-208. The host Indians lost several starters due to a band trip, and Viking Coach Jerry Dorneman used the opportunity to give some seniors and JV players a chance to play. Josh Marr won medalist honors with a two-over par 38. Jason Blanshine finished his season with a 42. Jason Ritthaler and Christian Donovan played to a pair of 46s in their first varsity competition, and completed the scoring for Cape (11-2-1). This week the usual starters returned to action for the Henlopen Conference championships on May 25.